Ahh… Pandora. There’s a certain hype that surrounds anything new that Walt Disney Imagineers create. A lot of the hype can be dismissed as extreme Disney fans going nuts for the newest piece of intellectual property that has been shoehorned into an existing attraction. What if Imagineering tackled something new? What if it’s not Disney in the slightest and just happens to be located on Disney property? It has been over five and a half years since Avatar was announced to be coming to Disney Parks. The photo above was taken at the groundbreaking in January 2014. In the five years, a lot of moaning and groaning came from the loyal Disney fan base as far as why Avatar would be in a Disney park. Others within the theme park community were sitting along the sidelines wondering how badly Disney could mess this up. We were invited to Local Media Day to take a peek at what Pandora: The World of Avatar will offer when it opens on May 27th, 2017. During the preview, we were guided around The Valley of Mo’ara and had a go at each of the main attractions as well as a taste of the offerings at Satu’li Canteen. The land itself is stunning. Looking from the Animal Kingdom parking lot it looks a lot smaller than when you’re standing inside. It does look like you’re on another planet. Once you cross that bridge you are on Pandora. This is the main attraction inside Pandora and you can tell the time spent on the land was mostly focused on this attraction. You start off inside a cave filled with paintings of the Ikran along the walls. The cave snakes through and eventually connects to the Avatar facility. I’m going to note that the queue for this ride is long. It’s one of the longest queues I’ve experienced, and it seemed to go on forever. The good news is that it’s all indoors so when the waits pick up, you’re at least inside the air conditioning. Once you make it past the initial caves the queue just gets even better. It’s hard to say that a line is as fun as the ride, but with the amount of detail inside it’s hard not to. It looks like the set of a movie and does a great job of setting the scene for what’s to come. Once inside the AVTR Project labs, you get to see some experiments underway. 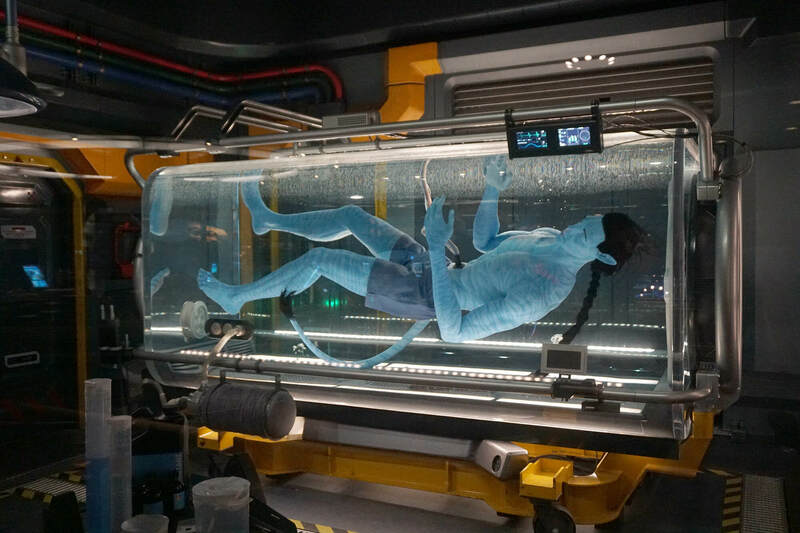 There’s a Na’vi suspended in liquid as well as some native plants that are being conditioned for reintroduction into the environment. If you pay attention you’ll also see the types of contamination that can happen and their effects on the Pandoran plants and animals. Once you make your way to the grouper you are sent to wait for your decontamination and safety briefing. This is where you’ll also be assigned the number for your Banshee simulator. You’ll get a quick briefing and explanation of safety inside the pre-show. After that, the other half of the pre-show is decontamination. Here… uh, you’ll uh… have a cool experience with some interactive screen effects. After that’s over you finally get to ride. Continue down to your assigned number and stow your belongings in the back wall. Going in the first time I didn’t know how restrictive the restraints would be. I’m a bigger guy but figured all would be well. The main issue was my legs not being pushed all the way forward so the leg restraints would lock. When riding the second time I removed everything from my pockets and had no issues fitting in the restraints. I’ll leave the ride experience to you when you visit Pandora after it opens on May 27th, but I will say it’s breathtaking at first. From a technical standpoint, it’s nothing more than a simulator, but the sum of the parts makes something worth experiencing again and again. This brief four-minute boat ride introduces guests to the flora and fauna of Pandora. Each four-person boat is loaded and sent off down the river. The boats are smaller than most rides, but they load quickly and we didn’t have any issues as far as hitting the boat in front of us while waiting towards the end. A downside to the small boats on the attraction is that there is not a wheelchair accessible ride vehicle. Most boat rides offer a wheelchair platform and ride vehicle for those who are unable to transfer to be able to ride. This may change in the future since the land and attraction are new, so there’s plenty of time to make changes in the future. The attraction does include brief encounters with screens and projections. All well blended with practical effects and it doesn’t detract much from the enjoyment of the ride. Small animals and some cool moments with projections that take place above the boat are some of the most impressive. The most amazing part of the ride is the encounter at the end with a Na’vi Shaman. She can be seen lighting up the forest around you all while welcoming you to Pandora. This audio-animatronic is seated on the river bank and waves and moves in the ways a person would if people were 10 feet tall. She’s a lot less creepy than she appeared in the marketing leading up to the opening of Pandora. This is probably because guests are only supposed to get a quick glimpse of her as they pass by on their boat. The main thing Imagineering complained about and Disney fans stood behind when the marketing around her came about. You were right. Na’vi River Journey is a solid family boat ride and definitely a great addition to the Animal Kingdom. Compared to the other attraction in Pandora it’s easy to see how some could see this as skippable. It is hard to compare the two attractions since both add up to a complete experience. Pandora really is something special. It’s a big step for Disney because it’s a complete themed land that is also an experience in itself. Something they teased with New Fantasyland at Magic Kingdom but failed to execute. Sure, other parks in Orlando have been doing this for some time, but that doesn’t make Pandora any less special. It’s worth checking out just to feel something new and unique which is what theme park fans have been asking of Disney for quite some time.